Summer in the UK this year hasn’t been too great, we had some hotter weather in July but since then its been cooler and wetter, so in light of this I wanted to make the most of any sunny days we did have and as I’ve been wanting to go to coast for a while, I picked the nearest, most easiest one to get to and went down for the day. 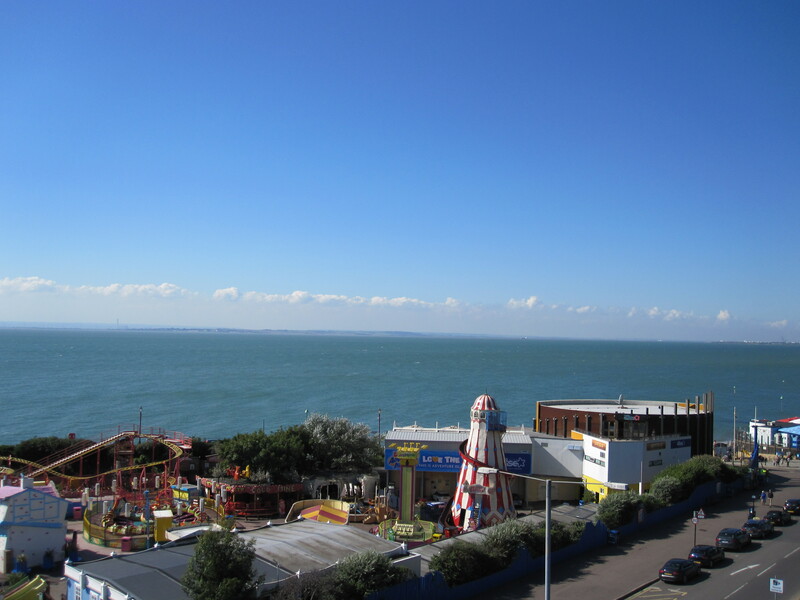 Southend on Sea isn’t one of the most prettiest beaches in the South East of England but it has lots of amusements and a long stretch of sand to enjoy. The view upon arriving was lovely; clear blue skies and a warm, bright day. Southend has the longest pier in the world and I thought this would be a good place to start. The pier is 1.3 miles long and you can either walk down or take the tram that runs back and forth. I decided to walk and see if I needed a ride back if I was too tired. The view along the pier was beautiful, and I really enjoyed the walk, although it was a bit cooler with the sea breeze becoming stronger as I got further out. There were also lots of benches along the way in case you wanted to stop for a rest or just enjoy the lovely view. On my walk up I saw several fishermen with their rods, I didn’t see any of them catch any fish but I’m sure they must have caught some later. The ‘reward’ for getting to the end of the pier was a restaurant if you wanted a nice lunch and a refreshing drink, a viewing platform and the Lifeguard station. After a taking in the view and visiting the gift shop I decided to walk back, I wasn’t tired and knew I would enjoy the walk over taking a tram ride. As I walked, I passed the fishermen still patiently waiting for a catch and watched as the coastline got closer and closer. Once back on mainland I stopped for a quick lunch before heading down to the beach. As I walked along the sand I stopped to watch the waves and dip my toes in the too cold-for-a-swim water. There were other people out too but it wasn’t busy which was nice. The sand at Southend is a mixture of sand, pebbles and seashells. There were lots strewn along the water’s edge, washed up and left behind by the endless tides. I was chuffed to spot an unopened oyster shell which seemed to still have oyster inside. Further up I spotted some colourful boats sitting on the deck in the bright sun. In the late afternoon, I dusted off the sand from my jeans and out of my shoes and strolled back to the train station and home. I don’t have the opportunity to go the coast very often but I always find it so calming and relaxing. Being by the sea on a warm, sunny day with a cool breeze seems to give me peace of mind and the beautiful, sparkling water is the coolness my eyes long for and just what I need after a trying time in the city.